GUIUAN, Eastern Samar – As part of his continuing support to Early Childhood Care and Development (ECCD) program, Eastern Samar Governor Ben P. Evardone turned over and pledged various infrastructure projects in the town of Lawaan and Guiuan. In Bgy. Sapao, Guiuan, Governor Ben Evardone lead the turn-over of a newly-constructed Day-care Center last August 8. During the turn-over program, Brgy. Captain Ronaldo Labutap related how he approached the Governor during the Community-Based Monitoring System (CBMS) Seminar in Baguio City last December to present the proposal for the said project, to which the Governor readily pledged his commitment to support the project. He cited that even though the barangay is not one of the pilot barangay for the ECCD program he approved the proposal of the barangay council. “Any projects and proposal regarding education are close to my heart,” Governor Evardone said in response to the overwhelming gratitude from the barangay. And as a further show of support to ECED, he announced that the provincial government will give an additional Php 500 pesos monthly allowance to all day care workers in the province. Also during the said program, the governor turned over P20,000 Provincial aid to Barangay Sapao, and distributed rice to the constituents of barangay. On that same date, Governor Evardone together with SP Member Jose Vicente Opinion, SP Member Enerio Sabulao and SP Member Betty Lopez Reyes lead the ribbon-cutting ceremony for the newly constructed Barangay Hall of Brgy. 7, Guiuan. 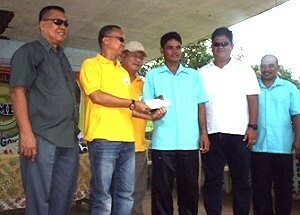 He also turned over a check worth P20,000 worth of provincial Aid to the barangay. The provincial executive, together with the board members present, also committed to allocate funds for a Day Care Center. “Hopefully, I would like to go back to your barangay to inaugurate your Day Care Center before Christmas,” he told the expectant parents and children of the barangay. He also announced that in line with the provincial government’s support to early childhood education, he was able to avail from the national government an allocation of 30 million pesos for the ECCD, which will be divided unto the towns of Borongan, Maydolong and Guiuan, to be used in the construction of day care centers and procurement of supplies and materials for the learning center. In the town of Lawaan, parents, teachers and pupils of Lawaan Central Elementary School (LCES) were in thankful jubilation during the turn-over ceremony of the newly constructed school stage worth P400,000. During the turn-over of the said project last August 7, 2009, which coincided with the Parent Teacher Community Association (PTCA) Induction, the Governor also pledged P100,000 for the drainage system project of the school. MAASIN CITY, Southern Leyte – Each speaker during the 9th Charter Day Anniversary celebration of Maasin City on Monday, August 10 called for unity – Gov. Damian G. Mercado, City Mayor Maloney Samaco, the Lone District Congressman Roger G. Mercado and even the guest speaker, Department of Interior and Local Government (DILG) Asst. Secretary Emeterio Moreno Jr.
Gov. Mercado is his inspirational talk expressed his appreciation to the city officials particularly for the good leadership Mayor Samaco has dedicated to the local government. “I am grateful to see that the Maasinhons helped for the development of Maasin. It’s been 9 years ago, when I sought for your support so that Maasin will become a city, and today, I have seen the full support of the Maasinhons and the Southern Leyteños” Gov. Mercado disclosed in Visayan language. Cong. Mercado further congratulated all different sectors present who graced the affair especially those who had given pride to Maasin City – the awardees. On the other hand, City Mayor Maloney Samaco who felt deserved for the moral and financial support of local leaders, vowed to strengthen the ties between them and promised to do his best for the growth of Maasin City. While ASEC Moreno, have seen unity and teamwork in Maasin City, “in convergence, many things can be done especially in the local government – empowerment and strengthening,” he said. Moreno, a lawyer by profession who represent DILG Secretary Ronaldo Puno said that government has five layers, from the barangay, to the municipality/city, to provincial level, district and the national level. “I have seen the unity from the barangay up to the district level and the national government, and in unity, nothing is impossible,” Moreno refers to the fast development of Maasin City and the province of Southern Leyte. The 9th Charter Day Anniversary celebration of Maasin City was also graced by National Labor Commissioner Aurelio Menzon, DILG Regional Director William Paler, and national, provincial and city officials and employees. TACLOBAN CITY – The Department of Environment and Natural Resources (DENR) in cooperation with Tanggol Kalikasan, Inc., a public interest non-government environmental law office, gathered some representatives from the Protected Area Management Boards (PAMBs) in Region 8 to a Regional (PAMB) Summit which was held at Ritz Tower de Leyte on July 29-30, 2009. The purpose of the Regional PAMB summit was to update the PAMB members on the new policies and guidelines on protected area management; identify problems, share experiences and gather baseline profile of all existing protected areas in the region; create a venue where focal persons in protected area management in the country may interact with scrutinize, study, reflect, learn and apply important lessons from field experiences on site. The summit also served as venue to capacitate and facilitate learning and exchange of information between PAMB members and Protected Area Superintendents (PASUs) from the DENR who are assigned to manage the operation of the protected areas. Per provision in the National Integrated Protected Areas System (NIPAS) Act or R. A. No. 7586, and its revised implementing rules and regulations (DAO No. 2008-26), PAMBs are organized for each established protected area. Membership in the PAMB is multisectoral, with the DENR Regional Executive Director as Chairman. The roles of the PAMBs are: by a majority vote decide the allocation of budget, approve proposals for funding, and decide matters relating to planning, peripheral protection and general administration of the protected areas in accordance with the general management plan for specific protected areas. Regional Technical Director Ricardo T. Tomol of the Protected Areas Wildlife and Coastal Zone Management Service (PAWCZMS) revealed that PAMBs were created for the following protected areas: Lake Danao Natural Park in Ormoc City; Mahagnao Volcano Natural Park in Burauen, Leyte; Samar Island Natural Park spanning over 333,300 hectares in the provinces of Samar, Eastern and Northern Samar; Biri-Larosa Protected Landscape/Seascape in Biri, Lavezares, Rosario and San Jose in Northern Samar; Guiuan Marine Reserve in Guiuan, Eastern Samar; Cuatro Islas Protected Landscape/Seascape in Inopacan and Hindang Leyte; Pan-as Hayiban Protected Landscape in Calbayog City; MacArthur Landing Memorial National Park in Palo, Leyte; and Hinabian-Lawigan Protected Landscape in St. Bernard, Southern Leyte. Chief Protected Areas and Wildlife Division, Corazon Makabenta disclosed that in the region, nine (9) protected areas covering 446,111 hectares are being managed with the PAMBs as the planning and decision making body on site and the PASu as the DENR Chief Operating Officer on site. Out of the nine PAs, seven (7) are with Presidential Proclamation under the NIPAS Act. “Considering the vital role of the PAMBs in protected area management, it is necessary that the members who act as potent partners of the DENR, be appraised and oriented on the salient features of the NIPAS Act (R.A. 7586) and its revised implementing rules and regulations as well as the other latest guidelines on protected area management”, says DENR Regional Executive Director Regidor M. De Leon. Aside from the NIPAS Act, other topics discussed in the summit include: Climate Change, Forestry Code of the Philippines, Local Government Code and its provisions on environmental protection, Wildlife Resources Conservation and Protection Act (R.A. 9147), Cave Management and Protection Act (R.A. 9072), new policies and guidelines on Ecotourism (E.O. 111), the Chainsaw Act among others. The participants in the Regional PAMB summit agreed to come up with capacity building and institutional strengthening activities to equip them in effectively discharging their respective duties and functions. Also, revenue generation measures which would usher in income for a sustained PAMB operation and protected area management formed part of the major agreements during the said summit. The DENR in cooperation with concerned stakeholders are doing all efforts in discharging their responsibilities in the management of the protected areas in the region for the benefit of the present and future generations. Protected areas are identified portions of land and water set aside by reason of their unique physical and biological significance, managed to enhance biological diversity and protected against destructive human exploitation. SALCEDO, Eastern Samar – After a fruitful implementation of Barangay Empowerment Network (Project BEN) through the Community Outreach Development Program (CODP) in Quinapondan, Governor Ben P. Evardone placed the project’s next stop in this another southern municipality bringing with him various programs and projects for delivery to its 40 barangays. Gov. Evardone awards the Php 20,000 Provincial Aid to the Barangay to Brgy. Capt. Anacleto E. Abulencia as part of the implementation of Project BEN through the Community Outreach Development Program in the Municipality of Salcedo. Project BEN, a partnership of cooperation and support between the provincial government, national government agencies and local government units (LGUs) in the province, revolves on the delivery of health services, infrastructure projects, employment opportunities and agricultural programs. Visiting personally some 4 barangays and the poblacion, Governor Evardone personally distributed PhilHealth Cards, packs of rice, sports equipment, toothbrushes and toothpastes. Also highlighting his barangay visits was the distribution of the P20,000 provincial assistance to every barangay. Those that he personally visited were the interior barangays of Sta. Cruz, Cagaut, Camanga, Cantomoja and Carapdapan while the rest of the officials of town’s villages were converged at the poblacion. Evardone reiterated that the provincial aid should be spent according to the needs of the people in the barangay as indicated in the Community Based Monitoring System (CBMS). “I am glad that all the barangay captains here in Salcedo have pointed CBMS-based projects,” the governor stressed. Mayor Melchor Gagante expressed tribute to the provincial chief for making an initiative to bring the services to the people directly. “This is unprecedented and I’m sure many lives have been touched because of Gov. Evardone’s wholehearted rendering of service to the people of Salcedo and the whole province,” Gagante said in a statement. Mary Jane Velasquez, village chief of Sta. Cruz, said she is personally is humbled with the visit of Evardone in her barangay. “This is the first time the highest official of the province visited us,” she shared in vernacular. Sta. Cruz is 11 kilometers far from the national highway and is accessed through a provincial road. The governor and his entourage took around a couple of hours to arrive in the said barangay. Punong Barangays Anacleto Abulencia, Rosita Ogania, Felicitas Baguinon and Alfredo Macatimpag of Cagaut, Camanga, Cantomoja and Carapdapan respectively, also uttered praises to the provincial chief for attending to the needs of their respective barangays. ABC President Joselito Abrugar said that the people of Salcedo has no reason anymore not to support any political plans of the governor as he already ‘proved himself how he cares for his people.’ “Why should we look for other alternatives when the governor already showed us the real meaning of public service,” Abrugar noted. Meanwhile, the governor also brought with him TESDA scholarship slots, employment opportunities, seedlings for farmers and rabies vaccination for pet dogs. Also in attendance to the activities were Sangunniang Panlalawigan Members Atty. Jovi Opinion, Atty. Enerio Sabulao, Colon Yu, Betty Reyes and Pedro Macabocsit. Also part of the governor’s group were Arnaldo Lavado (Prov’l Treasurer), Manuel Baldono (Prov’l Assesso), Efren Dala (HRM Officer), Jesus Agda (Prov’l Agriculturist), Gil Rebamontan (PSWD Officer), Vilma Bormate (GSO) and Dr. Romeo Debora (Prov’l Veterinarian). Representatives from Provincial Health Office and Provincial Engineering were also present. TACLOBAN CITY – It will take a lifetime for these 40 Basey families to forget President Gloria Macapagal-Arroyo and her “kindness and care” when she visited Basey, Samar on Sunday, August 9. These forty families are the beneficiaries of shelter assistance in the amount of P2.8 Million which was awarded by President Arroyo under the Core Shelter Program. The President also handed in a check in the amount of P96,000 under the Cash for Work of the Core Shelter Program. “President Gloria’s visit means so much to us,” one beneficiary said. “Her visit means safer house for us and for our children,” he added. The checks given by the President will provide shelter assistance to the forty families from Barangays Baybay and Palaypay, who were rendered homeless as an aftermath of Typhoon Frank in June, 2008. Basey town in Samar is recipient of the rehabilitation efforts of government as it was one of the most typhoon Frank-ravaged places in the Region. Each core shelter unit costs P70,000, while in the cash for work, the assistance per beneficiary is P2, 400. Thanks to President Arroyo and the project implementer, the Department of Social Welfare and Development, these forty families will now have environmental friendly structurally strong shelter units that can withstand a wind velocity of 180 kilometers per hour. The eligibility to the CORE Shelter Program is determined from the assessment of the city or municipal Social Welfare and Development officer and validated by the DSWD Field Office VIII. The assistance is facilitated through the conduct of social preparation activities. The qualified beneficiaries are organized into a Neighborhood Association for Shelter Assistance. Among the components of the Program are provision of technical and financial assistance, as well as Cash for Work for the family beneficiaries who work in the construction of their shelter units. Aside from the CORE Shelter Assistance checks, the President also handed in a P150,000 check for the construction of a Day Care Center at Barangay Salvacion, also in Basey. MAASIN CITY, Southern Leyte – President Gloria Macapagal-Arroyo inaugurates Sunday morning (August 9) the newly opened Maasin City Wet Market Section of the Integrated Market and Terminal Complex coinciding with the 9th Charter Day Anniversary celebration. The multi-million market building is the second phase of the Maasin City Integrated Market and Terminal complex project. The terminal component of the project was long before inaugurated by President Gloria Macapagal-Arroyo during her provincial visit last August 2005 in time for the celebration of the fifth charter day anniversary of the City of Maasin. The new, modern, and imposing wet public market structure situated just beside the integrated terminal at barangay Combado accommodates 171 stalls with its 36 meter by 36 meter area. The P73 Million new market which was recently completed is among the 13-point agenda of Mayor Maloney Samaco, to include the market and business enterprise improvement. The project which is funded thru a loan with the Philippine National Bank (PNB), however, the city government said earlier that the project is very feasible and it is in the position to easily pay off its amortizations since the project is income generating. The President clad in aqua blue casual attire, arrived in Maasin City after she inaugurated the Agas-Agas Bridge, in Sogod town earlier in the morning. President Arroyo led in the ribbon cutting of the city’s Wet Market before the program proper for the ninth charter day anniversary. She was accompanied by Sec. Gabriel Claudio, a designated Cabinet Officer for Regional Development (CORD) and Department of Public Works and Highways (DPWH) Sec. Hermogenes Ebdane. Congressman Roger Mercado, Governor Damian Mercado, Maasin City Mayor Maloney Samaco and Vice Governor Miguel Maamo. TACLOBAN CITY – The Lamiraw Regional Creative Writing Workshop (LRCWW) is now accepting applications for the 6th LRCWW slated on November 4-7, 2009 hosted by the Tiburcio Tancinco Merorial Institute of Science and Technology, Calbayog City through its President, Dr. Socorro Bohol. According to Harold L. Mercurio, project coordinator, fifteen (15) slots are at stake for young and adult writers who are willing to develop or improve their craft in fiction, poetry, essay, and drama. There will be nine (9) slots for writers residing in Eastern Visayas; three (3) slots for Abaknon speakers in Capul, Northern Samar; and three slots for fellows coming from Luzon, Visayas, and Mindanao (one slot per area). Mercurio informed that applicants should submit a collection of any of the following: 3 poems, 2 short stories, 2 essays, 1 one-act play, or any reasonable combination of the above in hardcopy and on a CD containing the manuscripts and your application form in Microsoft Word (Windows 2003, font 12, Arial) and two 2x2 pictures. Writers may send entries in Waray, Cebuano, or English and those entries written in Abaknon or in any regional languages in the country should have a translation in English or Filipino. Download application form at www.panitikan.com.ph, www.ncca.gov.ph, or simply google it. Sending your entries together with other requirements (scanned) through email (lamiraw@yahoo.com) is also accepted. Include in your submission a statement from one person of authority attesting to the originality of your works, Mercurio informed. Those who will qualify, Mercurio said, will be provided a decent housing, a modest stipend, and a subsidy to partially defray costs of the fellows’ transportation while walk-in auditors will have to pay a registration fee of P3,000 each which will cover their meals, accommodation, and workshop materials. Mercurio further informed that applications should be sent on or before September 30, 2009 to Harold L. Mercurio, Project Coordinator, Lamiraw Regional Creative Writing Workshop, c/o Office of the Arts, Social and Cultural Affairs, TTMIST, 6710 Calbayog City. Panelists invited for this years workshop are: Prof. Merlie Alunan and Dr. Victor Sugbo from UP Tacloban; Prof. Daryll Delgado and Prof. Larry Ypil from Ateneo de Manila University; Dr. David Genotiva from Eastern Visayas State University , Tacloban City ; and Mr. Dante Rosales from Calbayog City. The LRCWW is funded by the National Commission for Culture and the Arts and hosted by TTMIST. For more information, you may contact Lamiraw through 09177982781 or email lamiraw@yahoo.com. 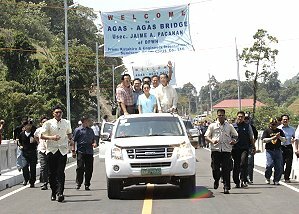 BARANGAY KAHUPIAN, Sogod, Southern Leyte – With the natural green scenery behind as background, President Gloria Macapagal-Arroyo drove through the 350-meter length Agas-Agas bridge, standing in an open pick-up vehicle here Sunday morning, an inauguration rite which signaled that the country’s tallest bridge is now open for traffic. Wearing a skyblue attire, the President was flanked by local officials led by Cong. Roger Mercado, Gov. Damian Mercado, Sogod Mayor Sheffered Tan, Japanese Ambassador Makoto Katsura, Department of Public Works and Highways (DPWH) Secretary Hermogenes Ebdane, Jr., and Region 8 Cabinet Officer for Regional Development (CORD) Gabriel Claudio, among other high-ranking officials present. The crowd jostled with security officers, cramming their necks for a good vantage point view to see the President, unmindful of the scorching heat of the midday sun. In her brief talk inside a makeshift tent by the middle of the bridge that doubles as the stage, the President cited the Mercado brothers for their strong support behind her candidacy, since the time she ran as Senator, Vice-President, and President. “Dili ko kalimot sa suporta ni Gov. Mercado, Cong. Mercado, sa akong kandidatura” (I cannot forget the support given by Gov. Mercado and Cong. Mercado in my candidacy), the President said, speaking in bisayan dialect, extending her gratitude as well to all people of Southern Leyte, which elicited a wild applause. “Congratulations, Secretary Ebdane for a job well done,” the President added. Earlier, in his welcome remarks, Gov. Mercado heartily thanked the President for the visit in behalf of the people of Southern Leyte, and in building infrastructure projects that can help in the development of the province. President Arroyo noted that the new bridge would be a big boost to the tourism development of the province and would greatly help in easing the flow of business and commerce for Sogod town in particular, and the rest of the areas from Luzon to Mindanao as the structure serves as a permanent link, a lasting solution to the perennial landslide problem in the area during rainy days. “Tourism will be enhanced, and the passengers will be convenient and assured of safety” in crossing this portion of the Maharlika highway, the President said. The President later talked with three residents in the area who testified that the new structure was a big help in their trading movements and in ordinary life for daily transportation needs, plus a secure passage as they will no longer fear being hit by falling rocks. After her talk, the President, other guests and visitors were treated to a jetlining rappelling exhibition from both sides of the bridge by professional extreme sports enthusiasts, a female adventurer among them. She then flew by chopper to Maasin City for another engagement. TACLOBAN CITY – President Gloria Macapagal-Arroyo visited Barangay Inuntan Elementary School, Basey, Samar on Sunday, August 9, in order to launch the Pantawid Pamilyang Pilipino Program (4Ps) in the province of Samar. President Arroyo assured that the pro-poor programs of her administration will be sustained especially if Congress will pass a bill institutionalizing the program. Pantawid Pamilyang Pilipino Program is a cash grant of P6,000 a year or P500 per month per household-beneficiary for health and nutrition expenses and P3,000 for one school year or 10 months per child for educational expenses for a maximum of three children per household. This provides temporary relief for the beneficiaries in order to sustain the nutritional requirements and assured that children enrolled will finish the school year. Brgy Inuntan is 12 kms from the Poblacion of Basey, Samar which is 29 kms from Tacloban City, a Highly Urbanized City in Region 8. The visit of PGMA made the road passable by motor vehicles which the road condition from Poblacion Basey, Samar before going to Brgy. Inuntan is not accessible except for the “Habal-Habal” a single motorcycle used for transportation. Ms. Ayn Jane A. Latoja, Belen L. Pardiñas and Arlyn O. Gaddi, Public Elementary School teachers in Brgy. Guerang Elementary School, a barangay before Brgy. Inuntan, said that in their 3 years of teaching they experience the hardship of going to their respective school assignments, that entails at least 30 minutes ride using habal-habal at a rate of P40 for every rider. This means an expense of P80 per day or a total of P2,400 per month. Indeed, this is a huge amount set aside by them every pay day in order to deliver the highest standard of education to their students. The three public elementary school teachers hope that the fare from Poblacion Basey, Samar to Brgy. Guerang and other nearby barangay’s will be reduced due to the road condition initiated by Department of Public Work and Highways (DPWH) as a way of tourist promotion in Basey, Samar. President Gloria Macapagal-Arroyo after successfully launching the 4Ps took a boat ride from Brgy. Inuntan to Panhulogan Cave, the largest of the three caves in Sohoton National Park that last 15 minutes boat ride. After the cave exploration, PGMA took a boat ride through the Golden River Cruise, as a tourist promotion package to see personally the enchanting beauty of the Golden River initiated by the Barangay Tourism Association, the Local Government Unit of Basey, Samar and Department of Tourism (DOT) headed by Director Karina Rosa S. Tiopes. Mayor Didi Estorninos of Basey, Samar thanked the President for her unwavering support to the pro-poor programs where in his constituents are among those identified as beneficiaries, as well as the special tourism promotion that will greatly benefit his fellow Basaynon’s. MAASIN CITY, Southern Leyte – President Gloria Macapagal-Arroyo launched here on Sunday, August 9 the Youth National Service (YNS) program, one of the priority projects of the government to underscore the importance of youth in the community and hence, to uplift their lives amidst the wake of global economic crisis. At least 142 youths availed the YNS program, to be implemented by the Department of Social Welfare and Development (DSWD), Department of Public Works and Highways (DPWH), Department of Environment and Natural Resources (DENR), Department of Education (DEPED), Department of Labor and Employment (DOLE) and the Philippine Nationa Polcie (PNP). 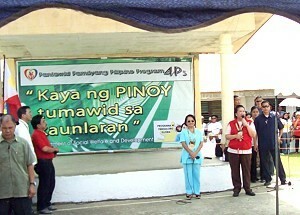 The beneficiaries were introduced during the visit of President Arroyo in Maasin City. 50 of them are committed to work with the DSWD, 20 will work for the DPWH, another 20 for the DOLE, 22 for the PNP, 20 with the DENR and another 10 for the DepEd. They also received their certificates of employment after the formal launching. Initially, the service program will be implemented in Southern Leyte, as one of the pilot areas. Other areas include Cotabato City, Pampanga and Bukidnon. Each agency committed to help skilled out-of-school youths and the unemployed/underemployed college graduates that are preferably member of Pag-asa Youth Association of the Philippines (PYAP), and those who are 18-24 years of age. The qualifiers will earn a P250.00 per day stipend. While, the DSWD disclosed their roles in the said program, such as to implement the National Service Corps – a community service program, a core strategy that will mobilize the youths in the implementation of social welfare and development programs and services in the community for a two-year national service commitment. It involves community-based programs, services and projects such as disaster preparedness, risk reduction mitigation and response, early recovery, disaster rehabilitation and center-based and residential care services. The implementing agency, particularly the Regional Directors were present during the awarding of certificates, namely RD Sol Matugas - DepEd, RD Forter Puguon - DOLE, RD Leticia Corillo and Asst. Secretary Vilma Cabrera, both from the DSWD, RD Regidor De Leon and Usec. Teresita Castillo from the DENR, DPWH Adm. Officer Lilia Mulaan and PNP P/SSupt. Nilo Donayre. QUEZON CITY – Foreigners who offer marriage to Filipino women in exchange for their kidneys or other human organs or issues risk running afoul of Philippine criminal laws, Cotabato Rep. Emmylou Taliño-Mendoza warned Sunday. "Foreigners cannot procure kidneys from Filipino women in return for marriage. They will definitely be held to account for violating Philippine statutes against the trafficking in persons or their human organs, and/or our laws banning mail-order brides," Taliño-Mendoza said. Philippine authorities prevented the man’s transplant. The Saudi man sought a kidney transplant at a Philippine government-run hospital, listing his new wife as his voluntary donor. Suspicious Philippine authorities ruled that the transplant was not a valid donation, but an effective human organ sale, considering the couple had married only recently and did not speak a common language. Last week, Taliño-Mendoza urged the Inter-Agency Council Against Trafficking (IACAT) to run after human organ smugglers preying on impoverished women in her province. In the Cotabato town of M’lang alone, human organ traffickers have already illicitly acquired kidneys from at least a dozen women, each lured with P200,000, according to Taliño-Mendoza. "This is one of the most repulsive forms of exploitation of women," she added. On Saturday, Immigration Commissioner Marcelino Libanan, a member of the IACAT, responded to Taliño-Mendoza's call and vowed to pin down foreigners and their local intermediaries engaged in the illegal human organ trade. According to the World Health Organization, the Philippines has emerged as the No. 5 global hotspot for human organ trafficking. The criminal trade involves mostly kidneys, since humans can survive with only one kidney. The Philippines’ Anti-Trafficking in Persons Act of 2003 penalizes the buying and selling of human organs. Those found guilty of engaging in the unlawful trade face 20 years in prison plus a fine of up to P2 million. Meanwhile, the Philippines’ Anti-Mail-Order Bride Law forbids persons or entities from matching Filipino women for marriage to foreigners either on a mail-order basis or via personal introduction for a fee. Offenders face from six to eight years in prison plus a fine of up to P20,000. Congress passed the law in 1990, after dozens of Filipino women lured by mail-order bride advertisements were found forced into prostitution overseas. Others ended up as battered wives or enslaved domestic laborers.